Animals are highly perceptive when it comes to understanding human emotion. So much so that many animals will pick up and take on the emotions of the humans they are with the most. In this week’s podcast I have a conversation with Susanne Peach who has dedicated her career to working with and tapping for animals. She shares what happens when animals take on the emotions of their human companions and how best to tap for them. About Susanne: Susanne Peach, Animal Energy Behaviorist, has been surrounded by animals her entire life. She has had the opportunity to study the energy of animals in many instances, from time spent on her godmother’s farm in Germany to a designation as a certified wildlife rehabilitator. 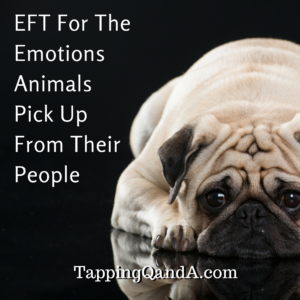 After successfully using EFT on humans, she learned by trial and error how to apply it to animals. She has dedicated her life to helping animals have emotionally happy and healthy lives, tapping for animals all over the world. Gene, Another great podcast. I have been tapping on my pets plus a friends so this gave me more direction, thank you. Is there away to see a transcript of this podcast #221?